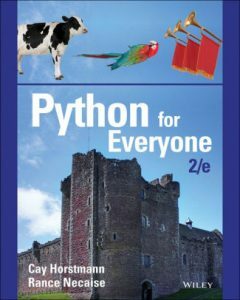 Python for Everyone book cover. The Association for Computing Machinery (ACM) named San Jose State University’s Cay S. Horstmann as a distinguished member for educational contributions to computing. A computer science professor in the College of Science, Horstmann has written several books that are used in introductory computer science courses including Big Java, Big C++, Python for Everyone and others. His books for professional programmers include Core Java and Scala for the Impatient and are also well regarded. In addition to his publications, Horstmann has been a long-time member of the College Board AP Computer Science development committee and has been an associate editor of the ACM Transactions on Computing Education. He developed a Udacity/SJSU course that is still used by many AP CS instructors and created educational software including Violet, GridWorld and Codecheck that he has made freely available to the community. Department Chair of Computer Science Sami Khuri noted that Horstmann’s books are used around the world, and that he has participated in educational panels and given international talks. Horstmann noted that SJSU has supported his efforts and allowed him to build up a portfolio of accomplishments over the years. Horstmann participated in the first cohort of the University Grants Academy in 2015-16. He said one of the key things he appreciated about the grant academy was the opportunity to learn about other research interests on campus. “It put us together with other people – otherwise you are a lone player,” he said, noting that he connected with other professors with whom he could collaborate in the future. The CS professor is one of five 2017 ACM Distinguished Members recognized for educational contributions to computing this year, with 43 total members recognized in all arenas including engineering and scientific contributions to computing. ACM, the Association for Computing Machinery www.acm.org, is the world’s largest educational and scientific computing society, uniting computing educators, researchers and professionals to inspire dialogue, share resources and address the field’s challenges. ACM strengthens the computing profession’s collective voice through strong leadership, promotion of the highest standards, and recognition of technical excellence. ACM supports the professional growth of its members by providing opportunities for life-long learning, career development, and professional networking.